The following is a list of tutorials for compatible software (shopping carts/e-stores/e-store builders). Please Note: This is NOT the full list of integrations. Click here for a list of compatible shopping carts or here for a list of compatible point-of-sale systems. 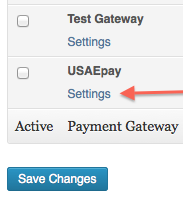 The following is a step by step tutorial describing the USAePay Gateway Payment Settings. Please navigate your browser to the administration area of CartManager by going to the web address www.cartmanager.com and logging in using your provided CartManager credentials. Once you're logged in please click on "4. Payment/Gateway Settings" link. Drop down the menu next to "Gateway" and select USAePay. The following page should look similar to this. Source Key- Enter your USAePay generated source key from your account. NOTE: this is not your login name OR password, this is a 32 character alphanumeric unique passphrase. Cart Mode- Select "Normal" to process a real charge or "Test" to run a test transaction. NOTE: Test transactions will be sent with the test mode flag on and will NOT be reflected in the merchant console therefore not be a real charge. If you select Authorize Only (Suggested when shipping the product) this will authorize your customer's credit card and you should see the transactions in the Queued Transactions area of the Batch Manager in your USAePay Merchant console. You will need to capture the funds manually in order to settle the transaction. 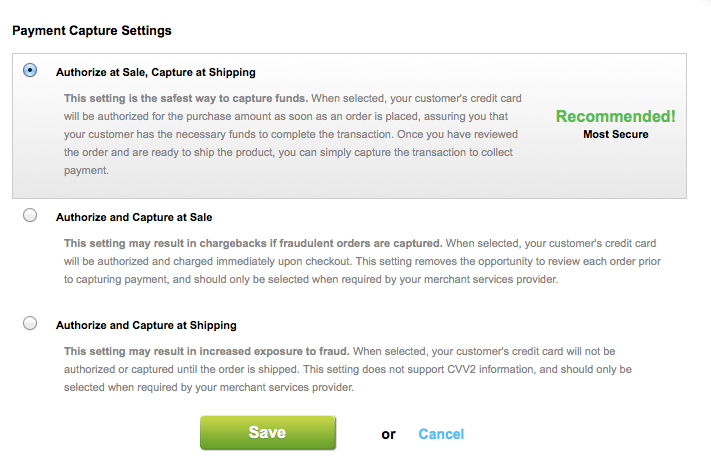 If you select Capture (Suggested for softgoods, downloads, memberships) this will process the charge immediately and you should see your transactions in the Batches area of your USAePay Merchant console. What Payment Methods Do You Accept?- Check all of the different payment methods that you accept. Type(s) of Order Transactions Allowed- Select "By Credit Card with Real-Time Processing (OnlineOrder)" to process using the USAePay gateway. Select "Required" from the drop down menu. Check "Collect Expiration Day on Cards (Month/Year are always collected)" to collect the expiration date, recommended. Run a small sale through your website and verify you see the transaction in the Batches area of your merchant console. This page provides a guide for downloading and installing a USAePay module for Cartweaver and v1.4.3 of the USAePay PHP library. Note: To use this module, you must use an older version of the USAePay PHP library, v1.4.3 - this library has been bundled with the USAePay module for your convenience. Install the files in the /cw3/CWLibrary/ProcessPayment/ folder. Edit the customer source key in the CWIncUSAepay.php file. The following is a step by step tutorial describing the USAePay Gateway Payment Settings. Please navigate your browser to the administration area of CommerceV3 by going to the web address http://www.commercev3.com/ and logging in using your provided CommerceV3 credentials. Once you're logged in please click into the store, and the part you want is under Settings / Options / Payment Options / Credit Card Options, and then select from the dropdown for "Choose the type of payment gateway you would like to use:" The following page should look similar to this. Merchant Key- Enter your USAePay generated source key from your account. NOTE: this is not your login name OR password, this is a 32 character alphanumeric unique passphrase. If you select "Auth Only (Suggested when shipping the product)" this will authorize your customer's credit card and you should see the transactions in the Queued Transactions area of the Batch Manager in your USAePay Merchant console. You will need to capture the funds manually in order to settle the transaction. If you select "Auth/Capture (Suggested for softgoods, downloads, memberships)" this will process the charge immediately and you should see your transactions in the Batches area of your USAePay Merchant console. If you select "Yes", the full amount of transaction will be used for authorization. If you select "No", $1 will be authorized instead of the full amount for auth only transactions. Select "Production" to process a real charge or "Test" to run a test transaction. NOTE: Test transactions will be sent with the test mode flag on and will NOT be reflected in the merchant console therefore not be a real charge. Click "Submit" to save the settings. Run a small sale through your website and see if it ends up in the Batches area of your merchant console. Direct your favorite browser to www.istores.com. 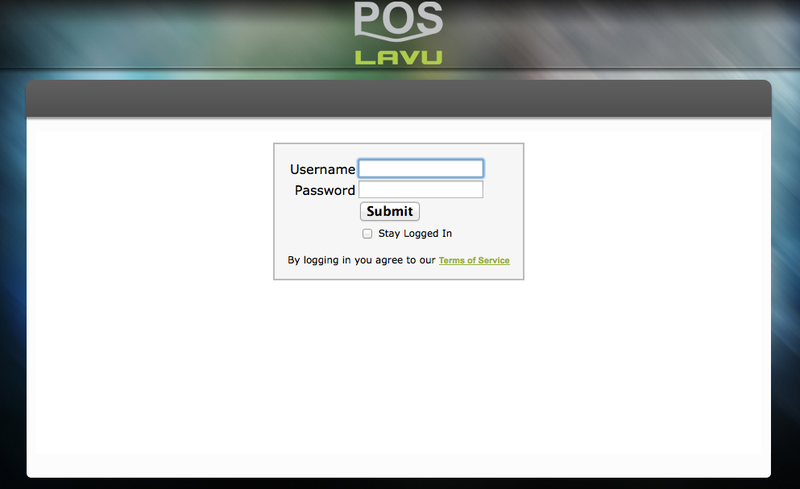 In the member sign in area type your site name and password and click Sign In. Click on the Store Manager icon. Locate the "Payment Gateway Configuration Area" and click on the "Gateway" dropdown. Select USAePay and click "Set". In the Key are paste your USAePay Merchant Console generated source key. Check "enable CVV" if you wish and click "Save Configuration" button. Finally click the "Apply Changes" button below. Go back to your website and make a small purchase. If everything was successfull then you will see your purchase as a transaction in the Queued Transactions screen of your USAePay Merchant Console. See the setup directions pertaining to USAePay. Magento is a popular opensource ecommerce platform that represents the next generation in shopping carts, ecommerce technology and web standards. The Community Edition can be downloaded free. For those who need enterprise features and support, a Commercial Edition is also available. USAePay maintains and supports a payment gateway extension for Magento 1.7 or later. This page contains instructions for installation of the module, a guide to the configuration options and troubleshooting assistance. Additional information is also available on our connect page. The easiest way to install the module is to use the Magento Connect Manager. 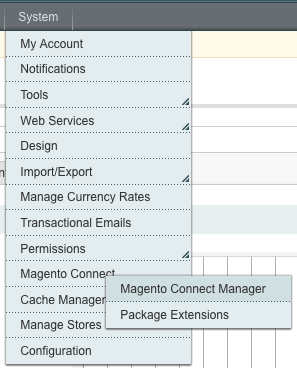 This is located under System - Magento Connect menu within your Magento admin area. 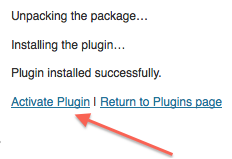 Once the install is complete you should be able to return to the admin console. If installation was successful you should now see USAePay listed in the Payment Methods section of the configuration screen. You can find this by going to the System menu and choosing "Configuration." The Payment Methods section is listed under "Sales." If you do not see USAePay in the list of Payment Methods, it is possible that this screen is cached. Try clicking the "Save Config" button in the top right corner to refresh the screen. If for some reason you are not able to use Magento Connect, you can manually upload the plugin files to your magento folder via FTP. These files must be uploaded into the same folders within your magento folder on your webserver. If you are not familiar with how to upload files to your website, please contact your web hosting provider. 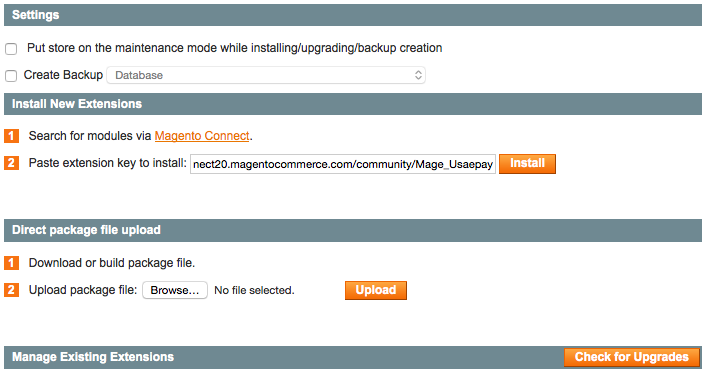 Once these files are uploaded you should be able to log into your magento admin console. If installation was successful you should now see USAePay listed in the Payment Methods section of the configuration screen. You can find this by going to the System menu and choosing "Configuration." The Payment Methods section is listed under "Sales." If you do not see USAePay listed in the list of Payment Methods, it is possible that this screen is cached. Try clicking the "Save Config" button in the top right corner to refresh the screen. If something goes wrong and your site is no longer operational, use your FTP program to remove the "app/etc/modules/Mage_Usaepay.xml" file. This will disable the USAePay extension. Enter your source key pin. This must match the pin that was entered when the source key was created. If you do not have one, leave this field blank. Change Accepted Currency to US Dollar. Click on the "Save Config" button. You should now be able to process credit cards via your USAePay account. Payment Action- Select 'Authorize and Capture" to make an immediate charge. Select 'Authorize Only' to authorize the card and then manually settle the funds at a later time (such as during shipping). 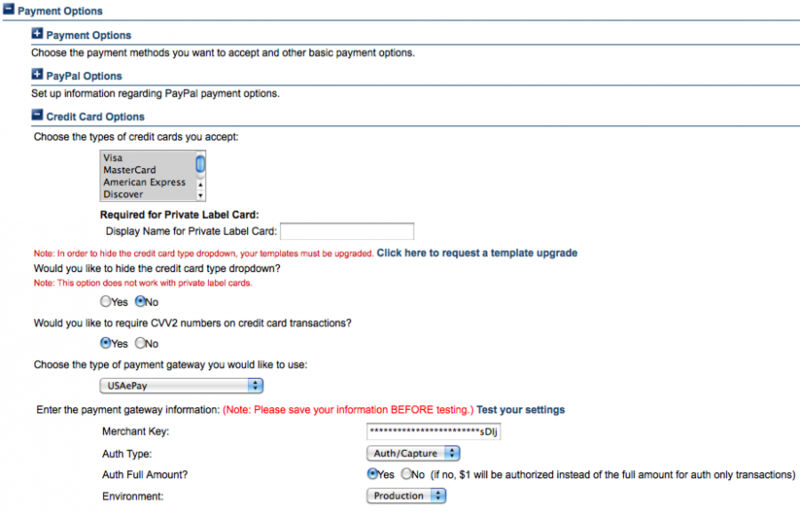 Title- Select a title for this Payment Option such as 'Secure Credit Card' or 'USAePay'. Source PIN- Enter a pin, if applicable. Transaction Description- Enter a description that will appear on all transactions or use #[orderid] to display the order ID. Accepted Currency- Unless you have a Multi-Currency gateway account this is always US Dollars. New Order Status- Select the status that will appear on all new orders. Use Sandbox- Select "No" to send transactions to your main USAePay account. Select "Yes" to send transactions to a "sandbox" test environment. Sort Order- If you have multiple payment options enter 1 to have this payment module be first. Payment from applicable countries- If you accept payments from all countries select this option or select Specific and the next section will be active. Payment from specific countries- Select specific countries to accept payment from. Minimum Order Total- Enter the dollar amount for a minimum order. Maximum Order Total- Enter the dollar amount for a maximum order. If you get this error, copy the folder app/design/frontend/default/default/template/usaepay/ to app/design/frontend/YOURTEMPLATE/default/template/usaepay where YOURTEMPLATE is the name of your custom template. ->('Payment authorization error: ' . $tran->error . Payment authorization error: Error reading from card processing gateway. (10132)SSL certificate problem, verify that the CA cert is OK.
Magento 2 is a popular opensource ecommerce platform that represents the next generation in shopping carts, ecommerce technology and web standards. USAePay maintains and supports a payment gateway extension for Magento 2.0 or later. This page contains instructions for installation of the module, a guide to the configuration options and troubleshooting assistance. Once downloaded, unzip/unpack the file. You should now have a folder called "Usaepay"
These files must be uploaded into the same folders within your magento folder on your webserver. You would put it into "app\code" directory. Example: app\code\ZS... If you are not familiar with how to upload files to your website, please contact your web hosting provider. 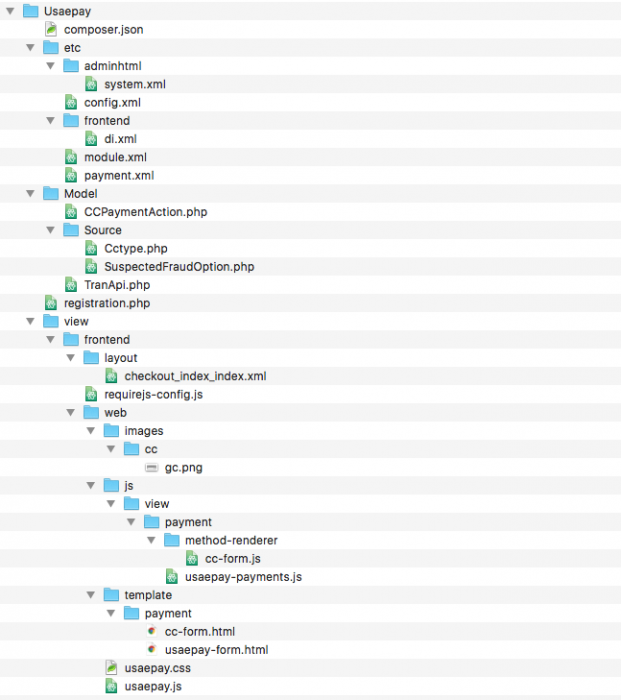 Once these files are uploaded you should be able to log into your magento admin console. If installation was successful you should now see USAePay listed in the Payment Methods section of the store's configuration screen. You can find this by going into the Stores > Sales > Payment Methods. If you do not see USAePay listed in the list of Payment Methods, it is possible that this screen is cached. Try cleaning the cache in Magento. Version: 2.0.0 (6/23/2009) This module has been tested on osCommerce v2.2 RC 2a. Upload each of these files to its corresponding osCommerce catalog directory on your website. If the files are uploaded correctly you will see USAePay listed under the payment modules menu (see below). For assistance uploading files please consult your web hosting provider. Enable USAePay Module Do you want to accept USAePay payments? Queue Transaction Should transactions be queued for your review at USAePay? Select "True" if you want to authorize credit cards not charge them immediately and see the charges in the queued transactions list of your USAePay Merchant Console. 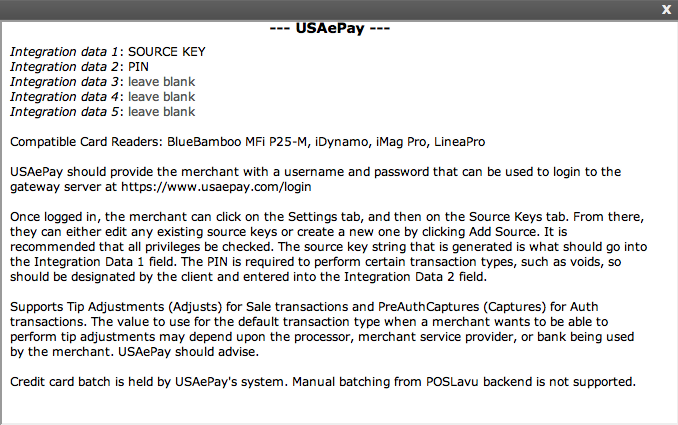 Select "False" for your charges to be immediate and appear in the "Batches" area of your USAePay merchant console. Credit Card Collection Should the credit card details be collected locally or remotely use the USAePay Payment Form? Customer Notifications Should USAePay e-mail a receipt to the customer? Payment Zone If a zone is selected, only enable this payment method for that zone. Please consult your osCommerce documentation or leave as "none"
Sort order of display Lowest is displayed first. Add a product to your cart to see if the USAePay payment module is in place. Don't forget to turn off test mode in the merchant console's source editor if running a live transaction. Open your web browser and go to your SearchFit Admin screen. The URL will be provided to you by SearchFit. It will be in the format of http://www.domain.com/scart/public/admin where "domain" is replaced with your domain. Select the option "Credit Card Processors" under "Payment Settings". Choose "usaepay.com" as your selected processor. Gateway URL - Enter "https://sandbox.usaepay.com/gate" if you are using the sandbox server to test your cart. You must have a sandbox account in order to run transactions on the sandbox. The address for the live server is "https://www.usaepay.com/gate". Use this once any testing has been completed and you wish to accept live transactions. Source Key - Put your source key here. Source Pin (optional) - If you are using a pin, put it here. Currency - Leave this as USD unless you are signed up to process in multiple currencies. Transaction Type - Set this to "Authorize and Capture" to have your transactions immediately captured and put into your batch. "Authorize Only" will send transactions to your queue. Transaction Mode - "Normal Operation" will run your transactions normally. Use this if you are running tests on the sandbox server or if you are capturing live transactions on the live server. "Test Mode" will function just like "Test Mode" on your source key, so transaction details will not be created and "TESTMD" will be returned as the authorization code. Remember, we always recommend that you conduct tests on the sandbox environment we have provided. Payment Name - This should be left blank unless you are working with multiple gateways. Submit Amounts - This should be left as "Selected Currency" unless otherwise instructed. Once all settings have been adjusted, click "Update" to save your changes. Your store needs to communicate with USAePay and the gateway communicates with your merchant account bank. Therefore your store software only needs to know the connection settings for your gateway. Navigate to Settings —> Payment in the home page of your admin area. 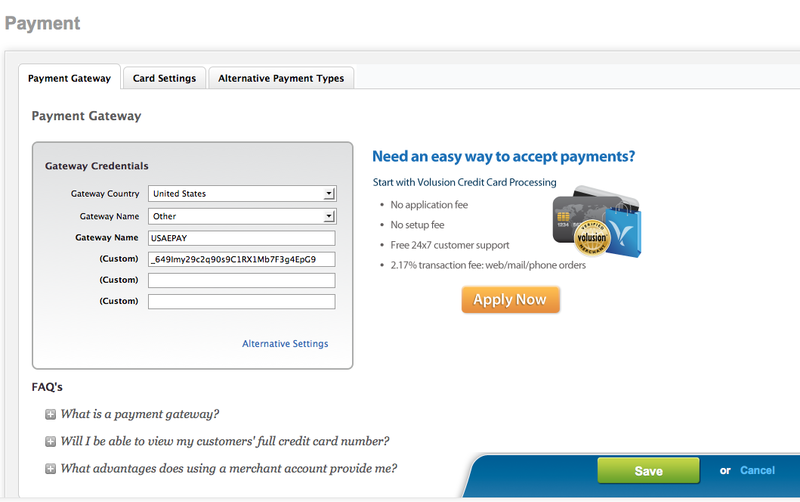 Custom: - Enter your source key from the USAePay Merchant Console. It's a 32 character alphanumeric passphrase that is generated by you the Merchant. DO NOT enter your login name for USAePay OR your USAePay password. This will not work. Payment Capture Settings: Select "Alternative Settings"
If you select Authorize and Capture at Sale this will process the charge immediately and you should see your transactions in the Batches area of your USAePay Merchant console. If you select Authorize at Sale, Capture at Shipping this will authorize your customer's credit card and you should see the transactions in the Queued Transactions area of the Batch Manager in your USAePay Merchant console. You will need to capture the funds manually in order to settle the transaction. If you select Authorize and Capture at Shipping this process will not contact the gateway and you will have to manually process the transaction through the vTerminal of your USAePay Merchant console. This is NOT recommended. Save the settings you just entered. Please Note: - Volusion currently does not support USAePay as a check process as of now. USAePay is capable if processing checks for a merchant as well. - Volusion does not support a PIN at the moment, only the source key can be used. Next, place a test order on your website for a product. After checking out and processing you should be able to see your transaction in USAePay's Merchant console under Batches or Queued Transactions, depending on the Authorization Mode that was chosen. When you are ready to make the module live, make sure your source key is not in test mode, otherwise it will not be reflected in the Batch Manager. This page provides a guide for downloading and installing a USAePay payment module for WP e-Commerce. 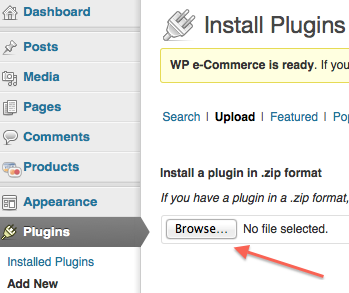 This module has been tested on WP e-Commerce 3.8.12.1 . Download the USAePay WP file and drop it inside your website folder. 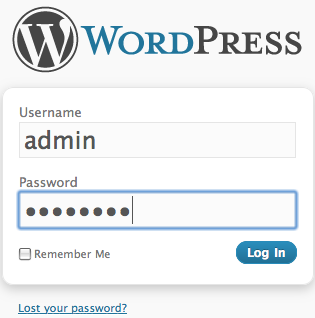 Item Open your web browser and go to your WordPress Admin screen and login. The URL will be provided to you by WordPress. Item In the Dashboard toolbar on the left, click on Plugins. Then click on Add New toward the top. Now click on Upload section. Click on Browse and select USAePay module that you downloaded previously and then click Install Now. After plugin has been installed click on Activate Plugin. Then go to the Settings section and click on Store. Select Payments section on the top menu. Click on Settings for USAePay plugin. Plug in your source key and pin from your merchant account and configure the rest of the settings.After you done click on Save Changes. 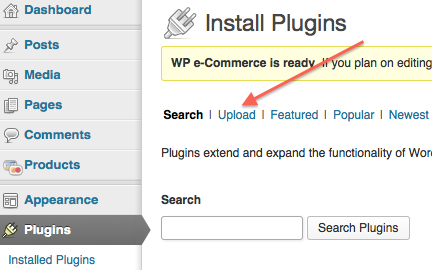 Now you can start using your WP Ecommerce with USAePay. Source Pin - (Optional but highly recommended) The pin increases transaction security and greatly reduces fraud. This pin must match the pin entered in the USAePay interface when setting up the source key..
Sandbox Mode - Select 'Yes' to use the Sandbox server. Your source key must be created on a sandbox account. Transaction Mode - Please select the mode that you would like to process your transaction in. "Authorization Only" will hold funds from your customers credit card and will place the transaction in your Queued Transactions screen. "Authorize and Capture" will also hold funds but will place the transaction into your batch, ready for settlement. Before starting this tutorial, please ensure that you have the most current version of the USAePay Zen Cart uploaded to your Zen Cart payment modules directory. At the bottom of the "Payment Modules" list click on USAePay. The payment module should appear on the right side of the screen. If you do not see it, double-check to make sure that the files were uploaded correctly. Enable USA ePay Module Do you want to accept USA ePay credit card payments? Select "Production" if you generated your key on the production server (secure.usaepay.com or www.usaepay.com). 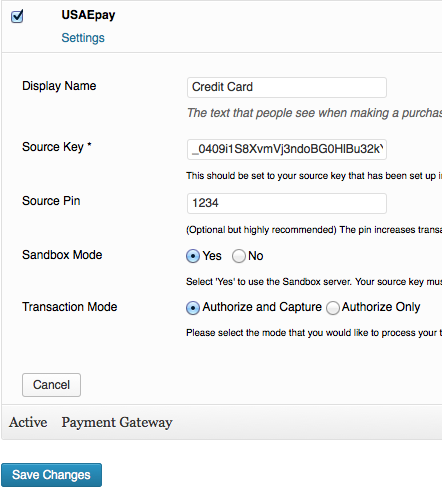 Select "Sandbox" if you generated your key on the sandbox server (sandbox.usaepay.com). Keep in mind that if you use a sandbox key in Production mode, or vice versa, you will receive an error that says "Specified Source Key not found." Authorization Type Do you want submitted credit card transactions to be authorized only, or immediately charge? Select “Authorize” if you want to authorize credit cards not charge them immediately and see the charges in the queued transactions list of your USA ePay Merchant Console. Select “Immediate Charge” for your charges to be immediate and appear in the “Batches” area of your USA ePay merchant console. Email Customer Do you want USA ePay to email the customer a copy of the order? Sort order of display. Sort order of display. Lowest is displayed first. 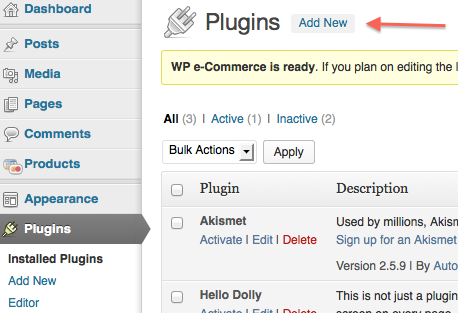 Select the appropriate status you want displayed for orders coming through the module. Click "Update" to save your changes. Log out of admin, or pull up another tab, and enter your store to purchase a product. Select a product that is small in price and purchase it. 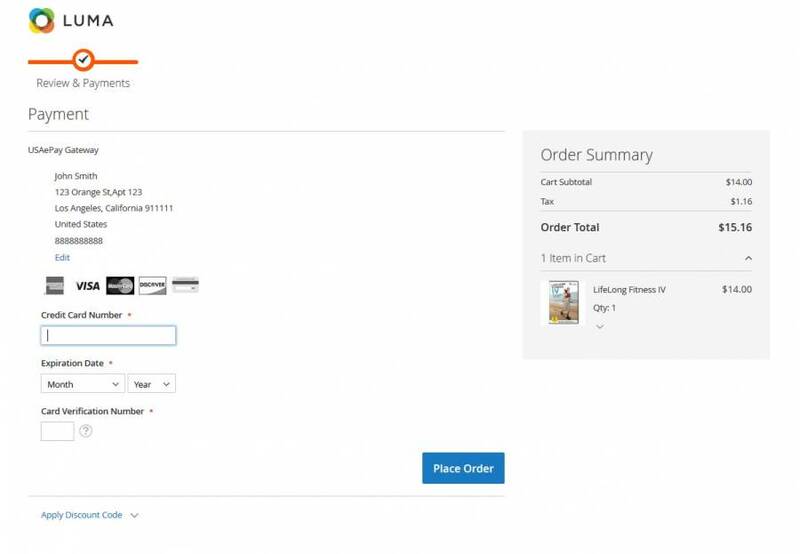 When you receive a confirmation from your cart that the order was successful, log into your USAePay account and view your batch to ensure that the order came in successfully. If the above step works, then it means your server is not setup correctly to validate SSL certificates. Please contact support for assistance. You do not want to leave the above setting in place for production use.